Jeff Davidson, a council member in the Virginia town of Herndon, died Saturday after sustaining serious injuries in a car crash, mayor Lisa Merkel announced. Davidson had lived in Herndon since 1986, his campaign biography says. He was serving his first term on the council after sustained civic engagement on the pedestrian and bicycle advisory and historic sign committees. He retired in 2016 from the Defense Technical Information Center after a 30-year career. 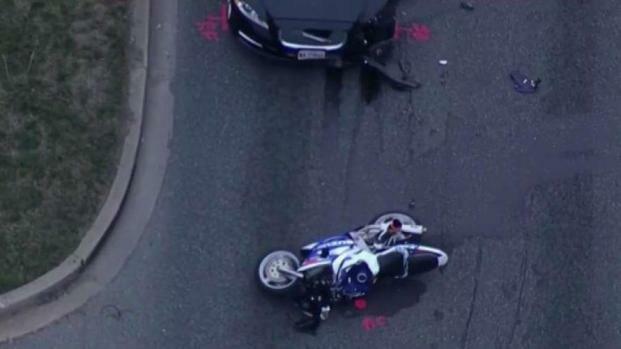 A D.C. police officer died in a motorcycle crash in Prince George's County, Maryland, police say. News4's Shomari Stone reports. Davidson was airlifted to a hospital on March 29 he crashed on Catoctin Hollow Road in Frederick, Connection Newspapers reported. Police say a Mazda was travelling north and crashed into a metal guardrail then drifted into the southbound lane, colliding with a pickup truck on US-15. Davidson, reportedly the driver of the Mazda, sustained serious injuries, police said. He was taken to a Maryland State Police hangar and then a shock-trauma center in Baltimore. Mayor Merkel announced the crash on Facebook the following day, commending Davidson's work with the town council. "His passion for Herndon has helped to shape our town," she said. Merkel said she would announce funeral arrangements when they are announced.